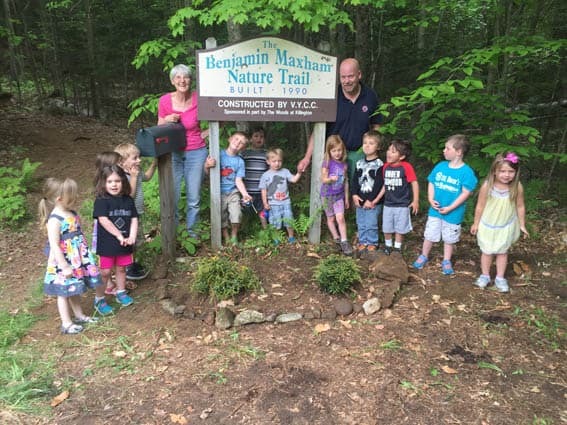 Nancy Evans Hamor and Jason Evans stand with the Killington pre-k class at the entrance to KES’s Nature Trail. KILLINGTON — Nancy Evans Hamor, past Sherburne Elementary nursery school teacher from 1968-1969, turned 70 years old last month. Her memories of her time in education are strong and happy ones. In honor of her 70th birthday she wanted to have 70 trees planted by family and friends in recognition of loving life, with an added focus of giving in part to her dedication to Global Environmental Development. She wanted to include as many people as possible in the effort and, therefore, 200 trees of all kinds, flowering plants and shrubs have since been planted in her honor all over the country. Presently her grandson Christopher Evans, son of Jason and Kim Evans, is a student at the Killington pre-k program, and her other grandson, Chris’s brother Henry, will be a student starting in December. Jason Evans wanted to plant something special, so he asked director of pre-k Betty Hughes if that would be possible. As the pre-k students spend a great deal of time in the outdoors, especially on the school’s nature trail, Hughes thought it would be fitting to clean up the start of the trail and plant two shrubs to enhance the sign. The pre-k class of 16 students, plus Henry Evans, Nancy Evans Hamor, and parent Beth Sarandrea, spent time raking, clipping, and planting two Japanese Pieris flowering bushes that will commemorate this beautiful occasion. Nancy Evans Hamor was very thankful to all who participated in her wish to make a difference in this world in conjunction with the National Arbor Society.